ColecoVision.dk Homebrew Section Presents: Matthew Householder. A nice piece of history after 30 years of silence. Because of copyright chose Matt to change the title and copyright owner's name. Moreover changed Matt the UFOs to look like flying bras. This version is from Jess Ragan and Jeff in 2007. Luc Miron made in 2007 this nice screen as a suggestion to how the title screen might look like. 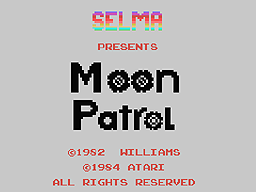 The programmer Daniel Bienvenu revised in 2009 drastically the game under the designation: "From Matt Patrol to Moon Patrol". He started to check inside the rom file and noticed a few things. 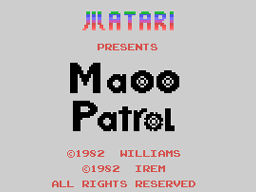 Daniel tweaked the game so it looks more like Moon Patrol, instead of Matt Patrol. Here is Daniels version of Moon Patrol. As a side note says Daniel: "The two big wheels in the title screen that makes the O's in "MOON" was already in the rom, simply needed to use them by changing the sprites attributes table". "I had to redraw the 'n' that was an 't' in "Matt" to complete the word "MOON". Ikrananka took over instead of Jeff. Ikrananka says: "I have decided to pick up the mantle on this one". "Would be great to have a more or less finished game that is close to the arcade in colours and graphics". 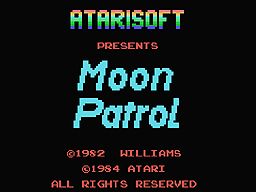 So the final title screen above will be used for Moon Patrol re-release in April 2014. Hi, I'm the guy who did the original Moon Patrol for ColecoVision in 1984. It was canceled by Atarisoft 30 years ago just as I was finishing it up and was about to do the title screen. Remember that Atari was losing $1M per day in early 1984. Time Warner told Atari to publish nothing more on ColecoVision and began looking for a buyer for Atari. A few months later TW found Jack Tramiel. I still have my original design/development notes - including my artwork and code. I still looked through them even today, and I also have the final approved box design and manual mark-up. 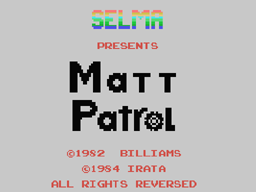 Nobody but me had a copy of "SELMA presents Matt Patrol" until 1996, when a collector talked me into selling him a copy. A few years later the ROM image was all on the Internet. I also have my title screen art for CV Joust. I didn't work on the Joust game -- just the logo for the title screen. I'm not sure if Larry Clague, the CV Joust programmer ever put it in his game. 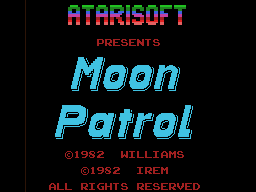 After I submitted my Moon Patrol ROM for the "final" time -- and was waiting for manufacturing approval -- I started coding a CV art tool = Coleco Screen Editor (CSE). Meanwhile, Larry wanted a nice-looking title screen for Joust. So, I finished my CSE tool and drew the Joust logo with it as a test-case. The CSE code ran on the ZAX Z-80 emulator plugged into the ColecoVision -- so you could see your work on the TV -- which helped greatly for anti-aliasing and such. It used the CV controller for all functions. CSE was designed to allow editing of 1/3 of the screen (top/middle/bottom) at a time. The other 2 (1/3) sections were for showing the character set and editing of 1 character in the character set. I did not work on other ColecoVision games. I was a month into designing a scrolling engine to port Vanguard to ColecoVision when I was switched to Moon Patrol instead. I have hand-written/drawn notes on my code and the other design data -- I don't have source code, as such. But I could dis-assemble my Moon Patrol ROM and produce source code. The Joust title screen does not exist, but I have my hand-drawn notes on how to render the Joust logo on the ColecoVision. I've worked in games since 1981. My first game was Krull for coin-op at Gottlieb in 1983. My second game was Moon Patrol for ColecoVision at Atari in 1984. I worked at Atari from 1983 to 1985. The last time I programmed was in 1985 when I wrote the line and polygon graphics primitives for the Atari ST operating system, GEM. Since then I have been a game creator, designer, and producer. I worked at Epyx from 1985 to 1988 where I produced Winter Games, designed/produced World Games, and created/designed/produced California Games (and numerous others). After that -- Activision/Mediagenic, Epyx again, DTMC (a Nintendo and Sega publisher), and 3DO. Finally, in 1996 I joined Blizzard North and helped them wrap up Diablo. Next (among other things) I recruited and hired dozens of people to develop Diablo II. I was producer of Diablo II at Blizzard North and wrote most of the dialog in the game. Fun fact: I created the "!" as the NPC quest marker. I also managed the Blizzard North sound department. In 2004 I joined the creators of Diablo at their new company, Flagship Studios, and worked on Hellgate: London. It flopped and the company went under. In 2009 I joined Playdom which was acquired by Disney. I designed and produced monetization content for Mobsters, Mobsters 2, Sorority Life, etc. on MySpace and Facebook. My final game for Playdom was "Kitchen Scramble" on Facebook of which I was co-creator and lead designer. Fall 2013 I quit Playdom and started a new company, "Play On Games", with another guy. We are building a new kind of word game for Facebook and mobile (iPhone/Android). My spare time is also used as a programmer for CollectorVision Games, and I has just began a game here in 2014 for just ColecoVision. I still have a ColecoVision (among other classic game systems). I still have my first computer that I built from a kit in 1976, Polymorphic Systems - Poly88. I have 2 coin-ops: Computer Space (in red) and Robotron: 2084, my favorite game of all time. To get in touch with Matt, try this: e-mail.